I’ve been jumping up and down for the past week or so, because I finally finished MY FIRST QUILT! YAY! I’m still really excited about it. It’s the first time in ages that I’ve made anything, and the whole process was so much fun (even more than I thought it would be). I learned loads. I can’t remember when I first started it (I should’ve taken better notes…), but I think it ended up taking me a little over a month, from start to finish. In terms of actual hours worked, probably less than a weekend. I faffed a fair bit, and I stopped every time I didn’t know how to do something… which added a few weeks of inactivity here and there. 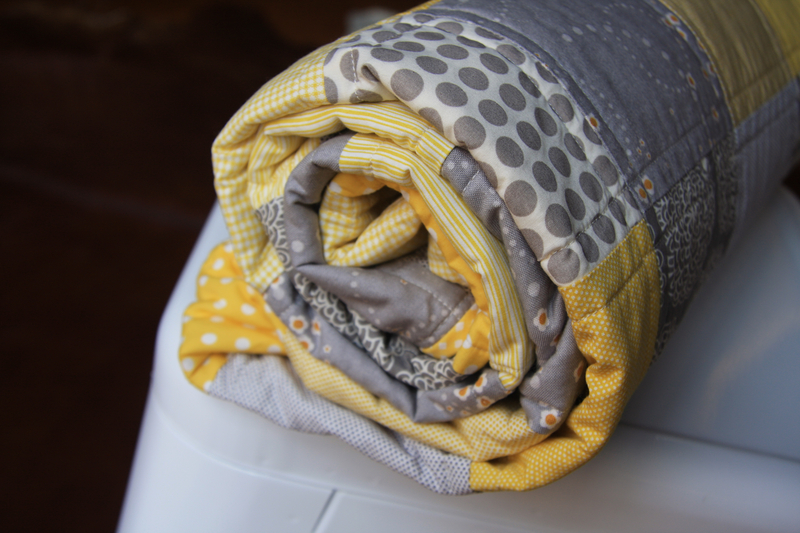 The whole point of making the quilt was because I’ve got a friend having a baby in August (hi Sparkle!) and I thought a quilt would be a cool gift. It should work as a cot quilt or as a throw for the floor to sit/lie/crawl on. I hope! 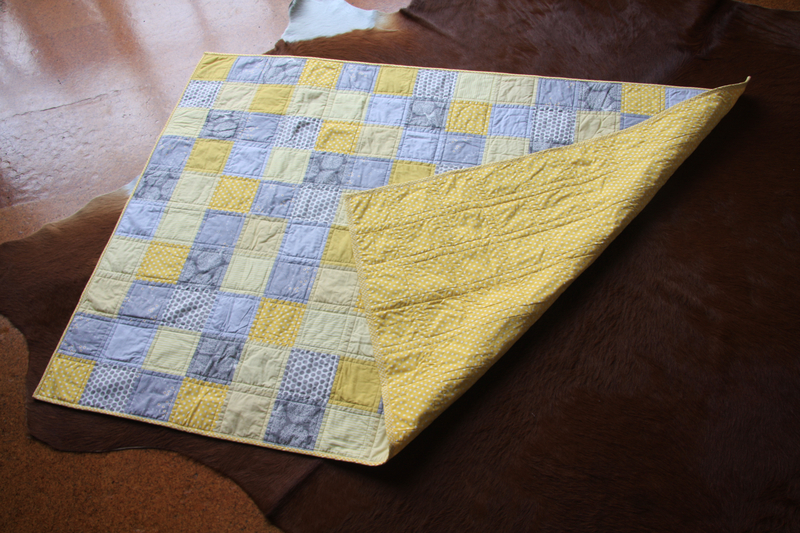 It’s a 10 x 14 grid of 4″ finished squares in a mix of yellows and greys (most of which I bought at GJs Discount Fabrics in Brunswick East). Everything is 100% cotton. Things I learned with Quilt #1: how to piece the front to the batting and backing, why a walking foot is important, why you should always check that your bobbin is full before you start sewing a very long line of quilting, the importance of the seam ripper, the difference between single-fold and double-fold binding, and how to attach binding to a quilt. Thing I hope to learn with Quilt #2: how to make half-square triangles, how to make my own bias binding, and how to take better photos of finished quilts. 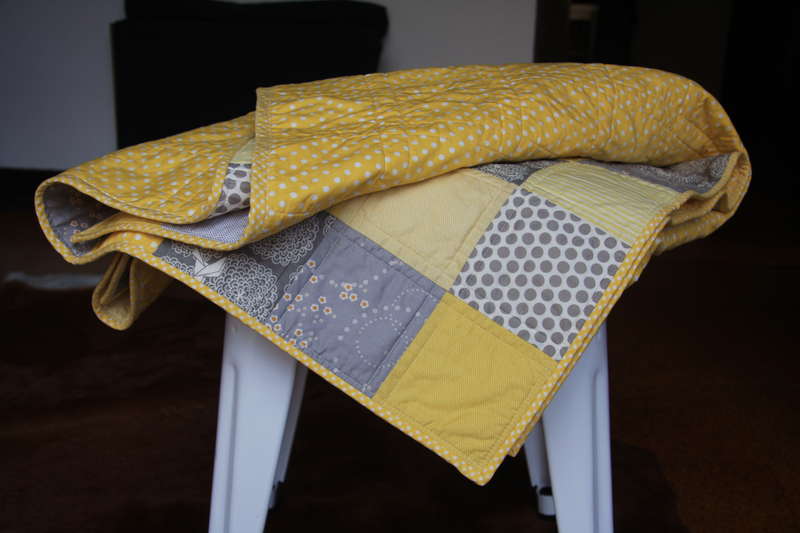 Did I mention how excited I am that I made MY FIRST QUILT?!?! Precise, classy and gorgeous. Not surprising really!